The frameset only option comes with a rear shock, mech hanger and rear axle. It’s the perfect starting place if your looking to build your own custom mountain bike. If you need any help with this or you’d like some further information, please contact us on 01254 814238. 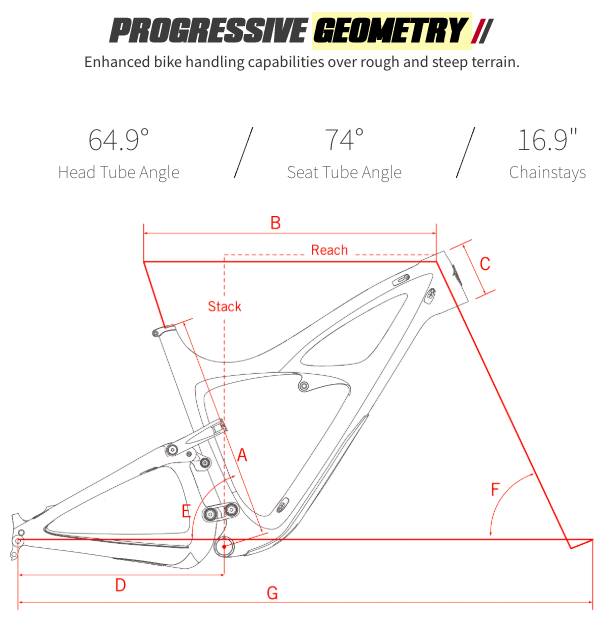 As bikes have become faster and more capable, the notions we held of what was ‘normal’ frame geometry have been blown out of the water and new trends have emerged. Folks seeking greater stability through longer front ends and shorter stems were buying a size up from what we expected. With the HD4 we’ve done that for you by increasing the reach by the equivalent of one size, but without the penalty of an overly long head tube or seat tube. The longer reach combined with a slacker head angle stretched out the wheelbase, and delivers confidence inspiring stability in the roughest and steepest terrain. No one thought they needed a dropper seatpost until they tried a dropper seat post, and no one needed a longer dropper seatpost until they tried a longer one, but you can’t enjoy the benefit of that extra drop if the seat tube is in the way. So we shaved 50mm off the top of each seat tube to give you room to roam. Now there’s enough room for shorter riders to run a 150mm dropper on the small sized frame, or a 170mm dropper for everyone on all of the other sizes, and still get your correct saddle height. Since the beginning of Ibis 2.0 we’ve partnered with suspension guru Dave Weagle to utilize his dw-link suspension technology to deliver an unparalleled combination of pedaling and bump performance, but dw-link is not a static design. Over the more than 13 years that we’ve worked together, his designs and our objectives have evolved. For the HD4 we utilize the 5th generation dw-link suspension system to maintain the pedaling performance that Ibis bikes have always been known for, but with more progression in the shock leverage curve, allowing for more big-hit capability in very rough terrain. With 6.25”(160mm) of travel up front and 6”(153mm) in the rear the HD4 delivers more than enough cush to handle the roughest tracks. In fact, the suspension is designed to stay high in its travel delivering a proportional response to small and mid-sized bumps, and only diving deep into the shock stroke on the biggest hits. Consequently, that 6” manages the terrain better than other longer travel designs that tend to wallow in their mid-stroke. Continuous refinement of our linkage design has resulted in a 40% increase in stiffness at the lower link, and 30% at the upper link than our previous designs. Plus, we laser etch instructions on how to install properly. "I'm down!" Designed to accommodate ‘piggyback’ style shocks without sacrificing the room for a water bottle, the HD4 ships with Fox's DPX2. The added fluid volume and twin tube damper design manages heat build up and bottom out better than standard inline shocks for the roughest enduro tracks. For riders who want a higher degree of tunability, we have an upgrade shock available on every kit, the excellent 2018 Factory Series Fox Float X2 with Kashima coating. To setup sag, go for 14 - 18mm / 25 - 30%. View the Ibis Bikes Size Guide.